Ah yes….fall. My favorite season. There are so many reasons to look forward to fall. The cooler temperatures…all the gorgeous colors in the leaves, pumpkin decorating and oh yes…candy corn! 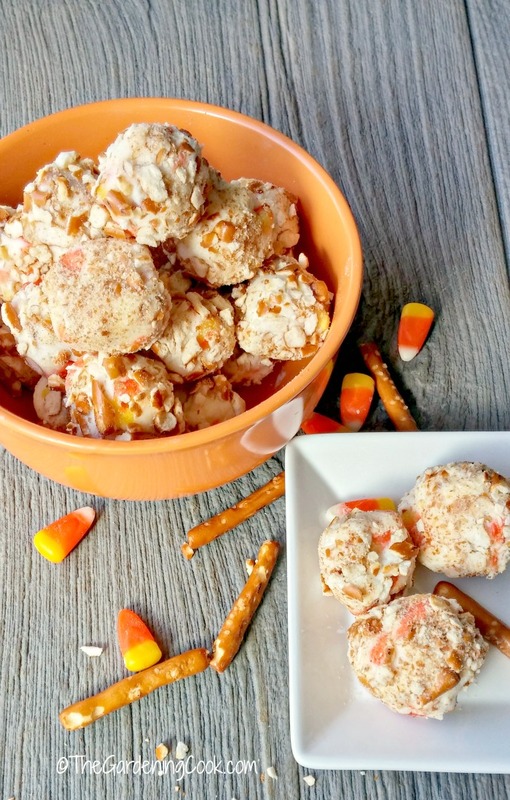 These candy corn pretzel balls are a delicious bite of sweet, salty, creamy fall delight. 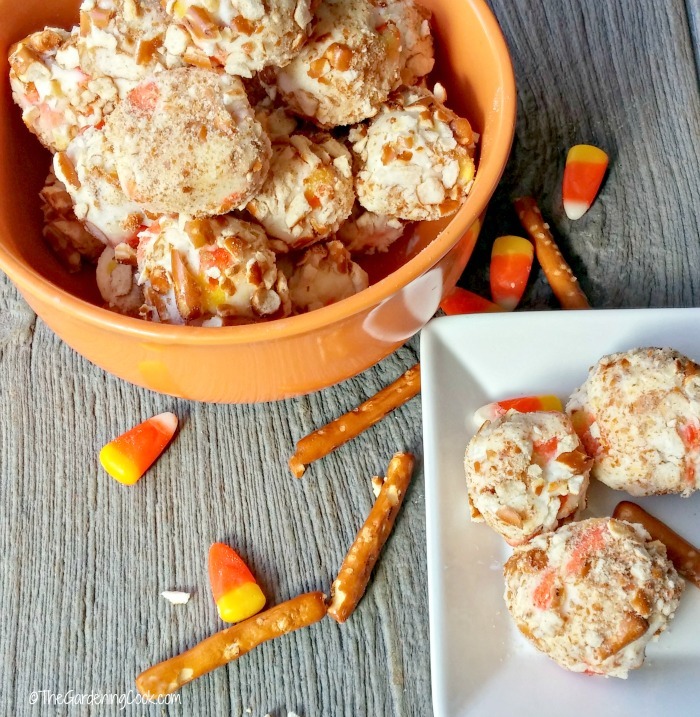 Time to celebrate the holidays with these candy corn pretzel bites. 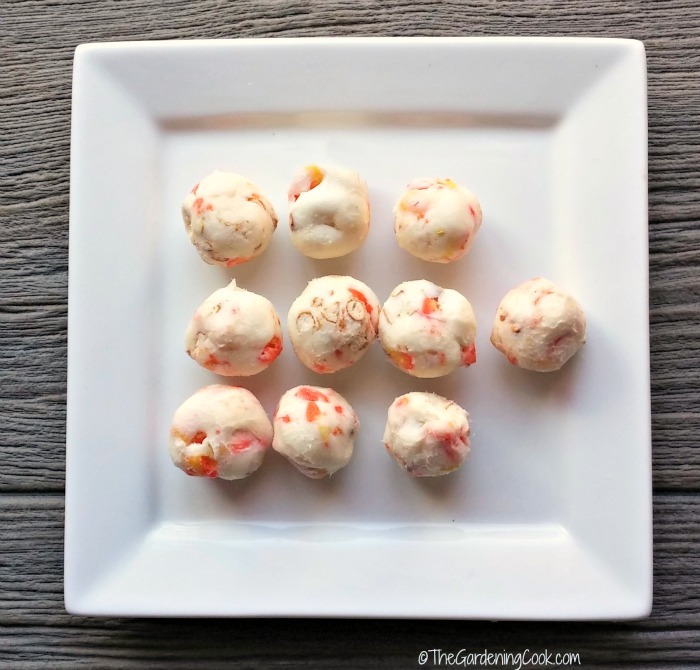 Sometimes a recipe of mine happens because of a mistake. In my case, it was spending all day long making some candy corn fudge, only to discover that I had not cooked it quite long enough and had to start over again. After all…who wants to throw out 6000 calories of fudge that won’t set? Not me…nosiree! My first batch of the candy cane fudge tasted great but did not set properly. However, it was the perfect consistency for this recipe and so it was born. One thing I learned from this is that the amount of time that you spend cooking fudge is directly related to how well it sets. Not to self…don’t take shortcuts with fudge….ever! Cooking tip for Fudge. In order for fudge to set well, it needs to be cooked to the soft ball stage. Have a glass of water near the stove and drop bits of the mix into the glass. When soft ball forms, it means the mixture has cooked long enough and will set well. Next it’s time to get out a meat tenderizer. I filled a bag full of pretzel sticks and went to town on it. (getting all my frustration out because I had to redo my fudge recipe and make it all over again.) Presto! 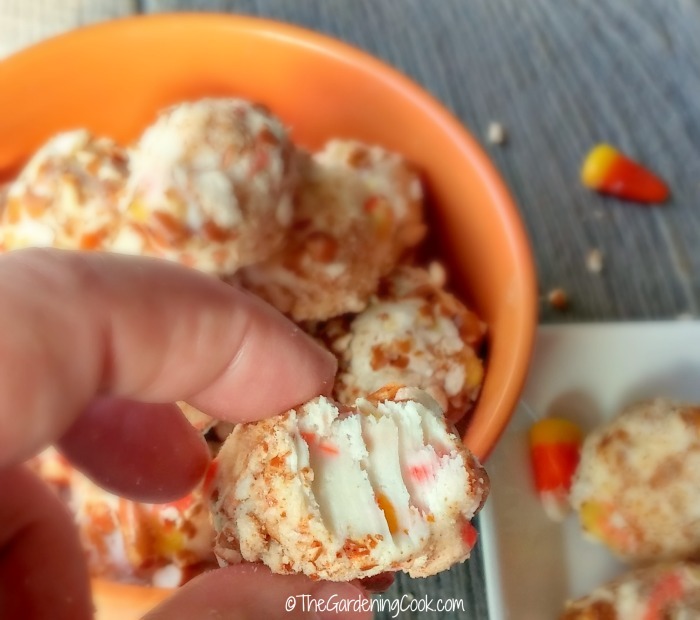 Candy corn pretzel ball coating all ready to use! You will want the consistency to be a little uneven. I wanted these bites to have quite a bit of crunch to them, so I just pounded until the pretzels were roughly chopped up….some bigger pieces and some crumbs. These bites are amazing. They are sweet, but not overly so. The pretzel coating is nice and salty and tones down the sweetness of the fudge well. Even my non fudge eating husband liked them! And the texture? Perfect for this recipe even if it didn’t pass the fudge test! 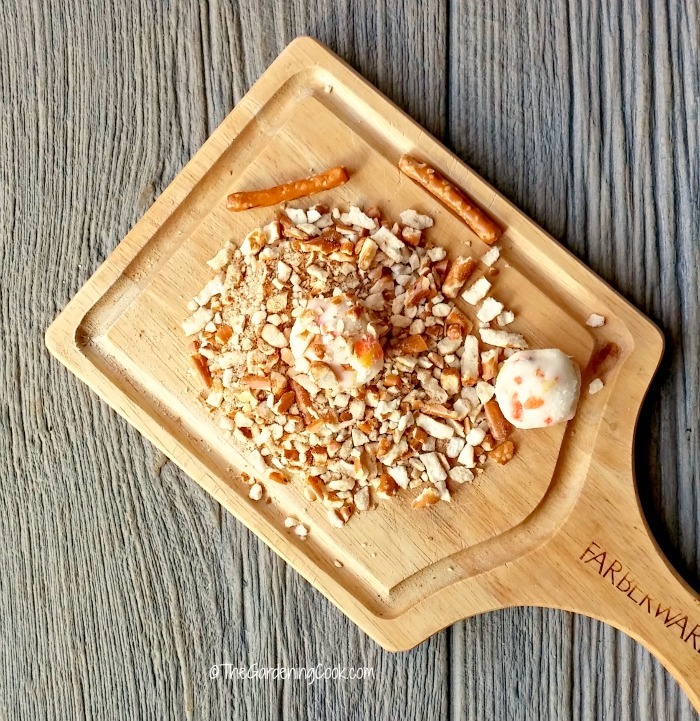 Have you ever resurrected a cooking disaster and come up with something even better? Tell us about it in the comments below! 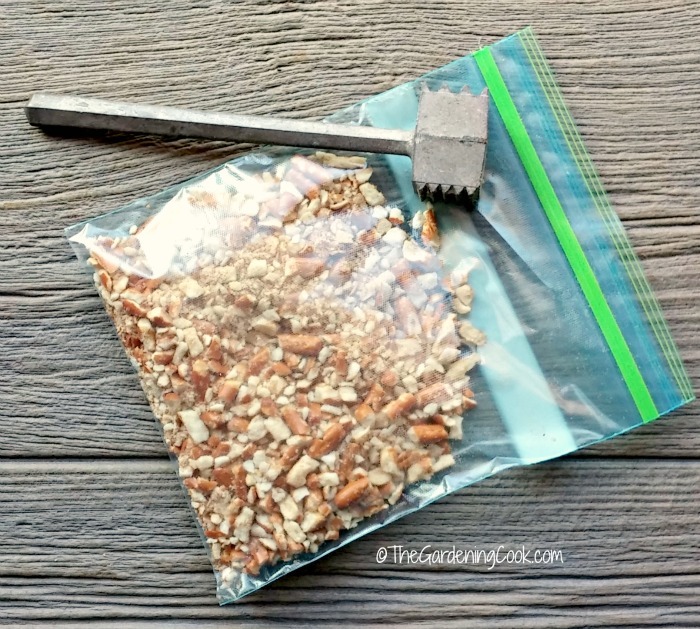 Extra chopped pretzels for coating. In a large pot, cook the sugar, heavy cream, salt and butter over a medium heat until it is smooth and soft. Cook the mixture for 7 minutes. Be sure to cook to the soft ball stage. Let cool slightly and add the the stand mixer with the chocolate and marshmallow. Beat until smooth and everything is well combined. 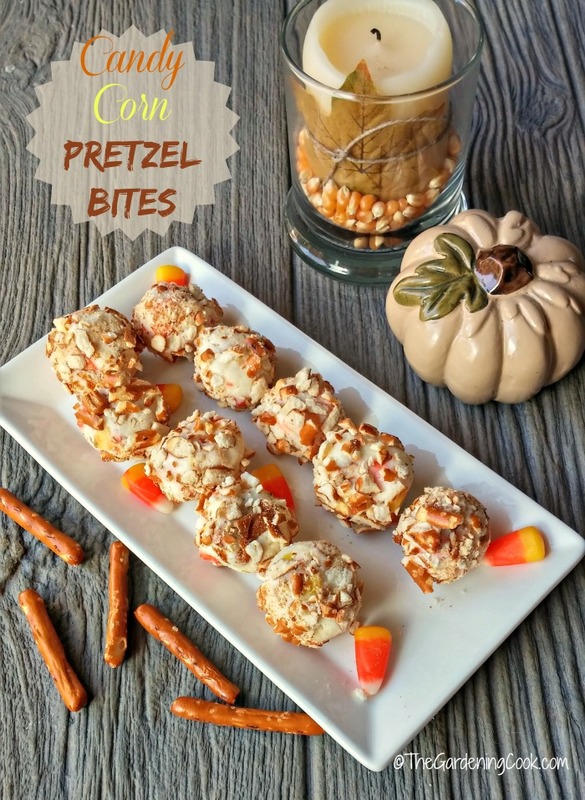 Add the chopped pretzels and candy corn. Place in the fridge until it is almost set but not firm. Remove and roll into 1 inch size balls. Roll in the extra chopped pretzels and return to the fridge until they are firm. 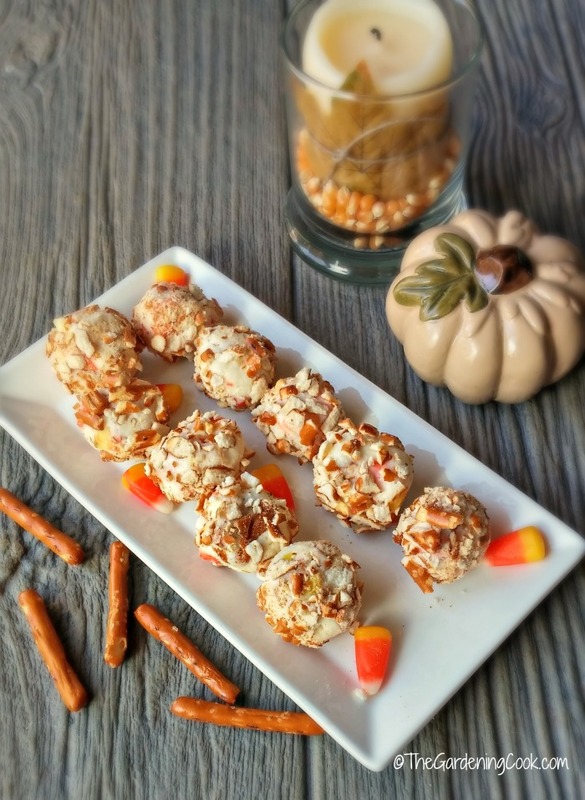 Makes about 40 pretzel candy corn balls each with 175 calories.